In India, around five out of every 1,000 newborns screened were found to have hearing loss. Furthermore, the identification of child's hearing loss is delayed because of poor awareness about presence of hearing loss and presence of hearing screening at birth. Parental denial and lack of readiness to accept a hearing problem is linked with delays in diagnosis and hearing aid fitting. , Grandmothers are always a part of an Indian family who live with parents of a child. Any decision in the family is often influenced by the significant others like grandmothers. They have an important role in guiding parents in bringing up of a newborn. Parents often seek their advice in taking care of their children since they have the experience of bringing up a child. In India, usually mothers stay with their parents during the delivery of a child. A child is with its grandmother at least in their first 3-6 months of life. Therefore, grandmothers' knowledge and attitude may influence any decision making regarding the child in the family. The information of knowledge on issues related to hearing loss and the attitude towards it will help in developing appropriate educational tools and in providing adequate counseling during the newborn hearing screening (NHS) program. Also there is dearth of studies on caregivers' knowledge and attitude towards issues related to hearing loss and NHS in India. To find the grandmothers' attitude towards NHS and intervention of hearing loss. A total of 102 grandmothers of the newborns in the age range of 37-64 years (mean - 47.26 years) participated in the study. The interview was conducted at 1 or 2 days after the child's delivery, in the postnatal ward and without any interference by other family members. Since interview could not be completed in two participants, the responses of only 100 grandmothers were taken. The subjects were from different socioeconomic status and educational background. The questionnaire has been adapted and modified from a previous study  which originally contained 15 items. The questionnaire used in this study had two categories, knowledge, and attitude [Appendix I] [Additional file 1]. Five items for the attitude towards NHS and intervention of hearing loss. A pilot study with 10 grandmothers was conducted. Based on the participants' feedback, the difficult terms in the questions were modified. The current study was carried out with each subject separately with their consent. The pictures of otoacoustic emission (OAE) and brainstem evoked response audiometry (BERA) testing were shown to the subjects to ask their preference of a screening tool. The average time taken for single interview was 15 min. Grandmothers' attitude towards NHS and intervention. A total of 63% of the grandmothers were aware that hearing loss could be congenital. Eighteen percent refused the possibility of congenital hearing loss and 19% were unsure. A South African study  indicated a similar rate of awareness of the congenital hearing loss (67%) among mothers. It is well-known fact that parents of infants with congenital hearing loss would like an early identification. , Poor awareness of congenital hearing loss may lead to delayed identification and thus the intervention. The findings suggest that there needs to be further improvement in awareness percentage. They may wait till an observable sign of absence of speech beyond 1 year or till such comparisons are made by others. On the other hand, a good awareness may prepare the grandmothers to suspect hearing loss right from the birth if any facilitating them to approach the healthcare professionals as early as possible. Results in [Table 1] shows that grandmothers' knowledge was relatively high for family history (67%), noise exposure (62%), ear discharge (51%), and high fever (50%) as causes of hearing loss. In contrast, their knowledge was low for medication (9%), birth asphyxia (9%), and jaundice (14%). Two studies , have reported poor awareness of the above factors as a cause for hearing loss among mothers. Generally, it appears that birth complications are not considered as a cause for hearing loss. Majority of the grandmothers did not indicate bewitchment (72%) and ancestral sins (69%) as a cause for hearing loss. Many Asians, including those from India believe that a disability or deformity is karma (fate), and therefore, nothing can be done about it. It is viewed as the parent's karma to have and raise a deaf child. Callaway  reported that in China, the attitude towards deafness tends to be very negative, particularly at the early stages. Parents of a deaf child will often spend vast sums of money initially with orthodox medical practitioners and subsequently with traditional healers before accepting rehabilitative intervention. These attitudes stem, in part, from indigenous traditions that contribute to the stigma of deafness and to resistance to both hearing aids and to sign language. 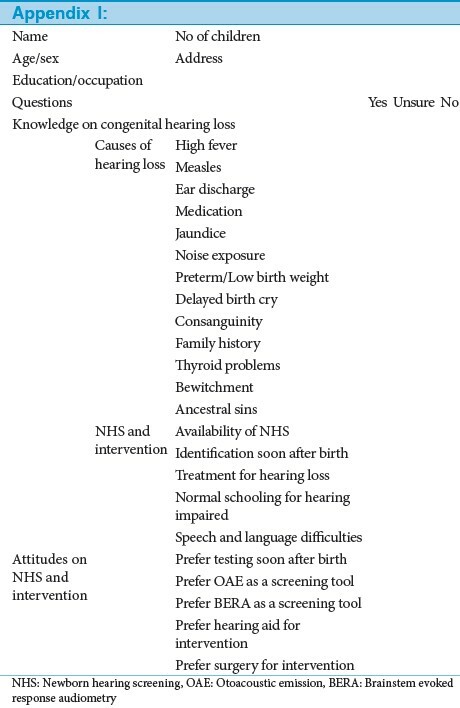 As shown in [Table 2], 75% of the grandmothers were aware that treatments are available for hearing loss, 67% knew about the speech and language difficulties, and 20% were aware that hearing loss could be identified soon after birth. Only 12% of the grandmothers were aware about the NHS. This in comparison to another study  on mothers reported a relatively higher knowledge (57%) on identification of hearing loss soon after birth. Thirty-three percent were aware that children with hearing loss could attend normal school with amplification devices. These results revealed poor information and awareness about NHS and intervention. A negative attitude was observed towards BERA as a screening tool and surgery as an intervention process for hearing loss. Good knowledge and healthy attitude among grandmothers may positively influence the family towards the decision making for early identification and intervention of hearing loss. So, careful attention has to be provided in creating awareness and in counseling towards the factors which had poor knowledge and negative attitude. Also during counseling, family as a whole to be involved because, individual member's lack of knowledge may lead to the delay in identification and intervention of the hearing impairment. Further research can study the knowledge and attitudes of the other members of the family and their attitudes towards hearing impaired children. We thank the Dean of Faculties, Sri Ramachandra University and Course Chairperson, Department of Speech, Language and Hearing Sciences, Sri Ramachandra University for permitting us to do the study. 1. Elssman S, Matkin N, Sabo M. Early identification of congential hearing loss. Hear J 1987;40:13-7. 2. Nagapoornima P, Ramesh A, Srilakshmi, Rao S, Patricia PL, Gore M, et al. Universal hearing screening. Indian J Pediatr 2007;74:545-9. 3. Sjoblad S, Harrison M, Roush J, McWilliam RA. Parents′ reactions and recommendations after diagnosis and hearing aid fitting. Am J Audiol 2001;10:24-31. 4. Yee-Arellano HM, Leal-Garza F, Pauli-Muller K. Universal newborn hearing screening in Mexico: Results of the first 2 years. Int J Pediatr Otorhinolaryngol 2006;70:1863-70. 5. Olusanya BO, Luxon LM, Wirz SL. Maternal views on infant hearing loss in a developing country. Int J Pediatr Otorhinolaryngol 2006;70:619-23. 6. Swanepoel D, Almec N. Maternal views on infant hearing loss and early intervention in a South African community. Int J Audiol 2008;47:S44-8. 7. Watkin PM, Beckman A, Baldwin M. The views of parents of hearing impaired children on the need for neonatal hearing screening. Br J Audiol Taylor IG. Hearing-impaired babies and methods of communication. Ear Hear 1985;6:25-8. 8. Cheng L. Deafness: An Asian/Pacific island perspectives. In: Christensen K, Delgado G, editors. Multicultural issues in deafness. New York: Longman; 1993. p. 113-26. 9. Callaway A. Deaf children in China. Washington DC: Galluadet University Press; 2000. 10. Marteau TM, Dormandy E, Miche S. A measure of informed choice. Health Expect 2001;4:99-108. 11. DesGeorges J. Family perceptions of early hearing detection, and intervention systems: Listening to and learning from families. Ment Retard Dev Disabil Res Rev 2003;9:89-93. 12. Watkin PM, Baldwin M, Dixon R, Beckman A. Maternal anxiety and attitudes to universal neonatal hearing screening. Br J Audiol 1998;32:27-37.